The Kenworth K200 sold by Tyquin Trucking in Victoria, Australia, a company that has been providing this area of Australia with bulk hauling since 1987. The Kenworth 200 has been approved as one of Tyquin’s fleet of bulk haulers. Tyquin has very tough standards as to what haulers they accept into their fleet. The Kenworth 200 is an Australian product sold to companies in New Zealand, Papau New Guinea and Australia. If you’re looking for a hauling vehicle to haul very large bulky items, the Kenworth 200 is your vehicle. Sturdy and reliable, comes with lots of options, a sleeper, option along with paint choices and kit options that makes this hauler perfect for those who want it tailored to their special needs. This vehicle was nicknamed the Tilly, after the company’s matriarch. This hauler comes with special alterations performed by the Hercules Engineering company and Ken Cowell Associates. 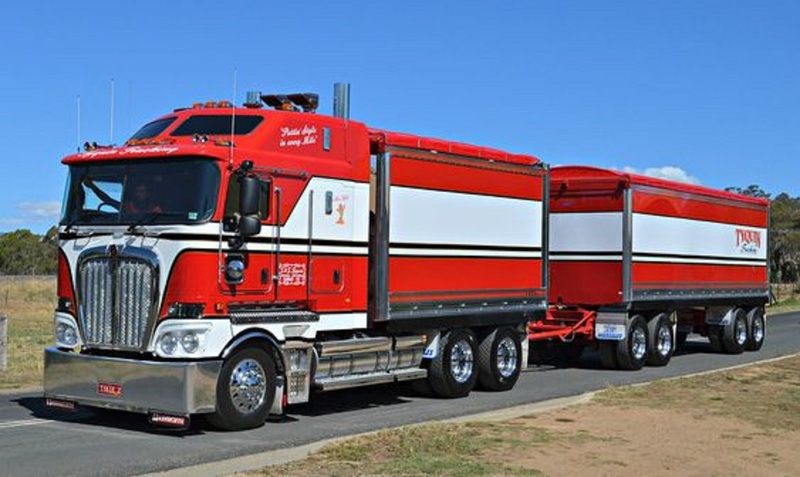 If you want to learn more about the Kenworth K200, you can do so by visiting the Kenworth Australia website, which provides plenty of information and photos of their various offerings. If you want to read up on the S&S Tyquin Kenworth K200, “Tilly”, you can do so by visiting their website, or by reading the write-up about the 25th anniversary from Power Torque, an Australian magazine that covers reviews, shows, and special interest pieces for those curious or involved with the trucking industry worldwide.